This past weekend I found myself [again] needing IV rehydration. I got behind and couldn't catch up. Least to say, it threw a wrench into my Sunday. Now I'm trying to solve the mystery about what it is in specific that puts me behind in such a way that I can't recover. Sometimes, even when I've played by the rules, I still get into trouble. Having a cold or other minor viral infection? I'm hoping it can solve that mystery before I wind up needing any more time in an ER or urgent care! Best quote of the weekend from an urgent care nurse (not the brightest crayon) after being told that I had just biked over 50 miles out to the airport and back, and seeing that I had been to the ER for similar dehydration and vomitting a month ago, "Your heart rate is 76, that's normal!" This said while I was laying flat (between vomitting) in a quiet room, and should have been at my resting rate. "Not for me. That's me compensating. Check out that diastolic blood pressure number again"
My BP was 100/42. Not that the bottom number is sometimes a better reflection of hydration and actual blood volume in a person who is compensating by vasoconstriction and mild elevation in HR. "What's your normal heart rate?" Hopefully in the future there will be less posting about dehydration and trips for IV rehydration, and more posting about fun stuff. That may require me to get a functional computer! In other news, I'm planning some bike touring over the next year, with trips ranging from Lake Erie all the way up to Toronto! I've been doing some weight training with fully loaded panniers on my Volpe and now feel comfortable (as much as one can!) on climbs in the 15% range for over a mile at a time. Well, this is the topic of the month for me and will be one of a series of posts I'm sure (assuming my computer starts functioning again). Once I heard a gastroenterologist say that the average person with an ostomy is approximately 2% dehydrated at all times. For a person with a high output ostomy, this could be higher. Also, because people with active Crohn's, Colitis, or other intestinal disease may be malabsorptive to some degree, electrolyte balance can be more difficult to acheive. It may be impossible to follow a standard hydration regimen and expect the same results as your peers without intestinal disease. For myself, I notice that I require a drastically higher concentration of electrolytes, and more water intake, than other people who are cycling at the same effort. I've been known to concentrate my gatorade to the point of it being gritty because no more salt and sugar will go into solution! Gross! But, the alternative is getting terrible leg cramps early on. I had this happen on approximately mile 20 of the NY Get Your Guts In Gear Ride, and have had terrible calf spasm on hot days in Pittsburgh when I have skimped on gatorade mix since then. Increase salt and potassium, and magically my cramps go away. But, it's not that simple. Hydration is not something you can make an afterthought without getting into trouble and not being able to get out fast enough. When you notice you're dehydrated, it's often too late. How do you stay ahead of the game? 1. Prehydrate: I carry around my tall bike bottle all day and make sure I'm drinking enough. If I feel foggy, my electrolytes are probably a little out of wack. If my symptoms improve after some gatorade or Emergen-C (has more potassium than sports drinks, little sugar), then I've validated my suspicions. Some guys who race drink Pedialyte the night before a ride. This is great, but you can do it for a lot cheaper by mixing up your own balance of gatorade and Emergen-C.
2. Eat enough carbs: Carbohydrates help you stay hydrated, beleive it or not. I don't eat immediately before riding, but will eat a rice cake with some peanut butter, or some tortilla chips and mild, fine cut salsa, about two hours prior to a training ride. Both of these food items also have a little bit of a salt kick to them as well. Your body doesn't hydrate well if you are running on too few carbohydrates. It just doesn't work out well. Plus, we all know that carbs equal quick energy, which is important for feeling up for an up pace ride! 3. Hydrate on the ride! Bring more water than you think you need. Drink every time you stop. Get more gatorade at every chance you can. I have started carrying extra gatorade powder in my jersey pocket, so I can add it to water or mix it into gatorade that I've bought at a convenience store stop on a longer ride. 4. Don't forget to bring your 'lytes! Headlights and taillights are usefull as well, but I'm talking about quick sources of electrolytes, just in case you start getting into trouble. Bouillion cubes are small, portable, don't melt and are a great source of sodium. I went to a local natural food store and got some vegetable broth ones because I couldn't quite get past the fake chicken smell and taste of regular ones. The veggie cubes have just as much sodium in them, and taste intensely like parsley... which does nice things to your breath for a while as an added bonus! Although they are more expensive than some boillion cubes, I've also become quite fond of the Margarita flavor of Cliff Shotblocks. This flavor in particular has 3x the sodium of others, and shuts down those calf cramps quickly the majority of the time. If I'm starting to feel slow and foggy on a ride, I eat a few and suddenly feel alive again. It's amazing what a difference it makes! 5. Know your stats: Know what effort you can expect to maintain in what conditions, and what sort of feul you need to keep yourself going. When you plan a route, especialy one off of main roads, it only takes a few minutes to google gas stations in the area. Put them on your map in marker. Using a cyclocomputer helps me keep track of my effort and pace myself. I use a computer with a heart rate monitor built in, and I know what I can expect my heart rate to be at different speeds and percent grades. If my heart rate is higher than I know it should be, and there is no other good reason (too much coffee at work, getting over a cold, etc) then I can assume it is because I am dehydrated enough to jack up my cardiac effort. Keeping track of my heart rate does more than help me pace myself, it also helps me set my rate for hydration and rehydration. 6. Be willing to readjust your plan: Be aware of your hydration status, and how much longer you can go on. If you are really truly getting into trouble, maybe it's time to consider how much longer you MUST keep on going. If I'm cycling in town and am a mere 12 or 15 miles from home, that is a very different situation than finding myself getting dehydrated or with electrolyte abnormalities out accross the West Virginia or Ohio state border. If you are close to home and can plan on getting back to your end point before hydration, go for it if you can do it safely. But, with 50 or 60 miles to go, it may be time to start planning a longer stop of an hour or two. Depending on how far out of wack you are, you may need longer, or a real exit plan. But, that's the worst case scenario. Probably a few bottles of gatorade in the shade of a convenience store and a snack will get me back on the road to home. If others on the ride will absolutely not wait, that's ok. It's better to ride home alone and make it home, then have a major emergency while trying. 7. Rehydrate! Agressively rehydrate sooner than later. Drink more than you think you need to, eat some salty snacks (especially if you are craving them. That means your body is telling you that you need it! ), and cool down. V8 is suprisingly effective in replacing electrolytes and micronutrients. Get some good carbs in after a ride too, it will help you recover for next time. With so much attention to protien in popular media, it's easy to forget the carbs after a workout. Even with all of that planning and thought about hydration, I am still trying to figure it out. I like to ride hard, and this past weekend rode myself right into the ER (well, figuratively, not litterally...) by getting seriously dehydrated and running a low potassium because I was not replacing it as well as sodium. I've also started seeing a sports nutritionist for some guidance on making these subtle tweeks to my daily diet and hydration during cycling. More on that to come! Oh, and, want to see who joined me on a ride yesterday evening? No, I didn't die or fall off the face of the earth completely. But, my laptop did! So, I'm now at work, on lunch... and thought I'd put up a quick post while I can. Hopefully I will be able to remedy this computer situation soon! I will be resolving it before the Fall term starts, at latest, If not before then. The New York Get Your Guts In Gear Ride was awesome! I will post a real peice about that (and leg cramps...) soon - perhaps this weekend if I have any free time on my Sunday shift as a Paramedic (if the dear people in my district can take a break from blowing themselves up with fireworks this weekend). Other reasons for my lack of posting, and drastically reduced riding time, include strep throat that just won't quit! I've now been on three rounds of antibiotics and am onto the really serious stuff (Avelox). I'm still generally feeling cruddy but have been getting in some riding here and there. I think that is the real difference between people who have a chronic illness and those who don't: a better understanding of what it means to work through pain/illness. Last weekend I did a pretty gnarly hill ride with strep and a phenomenal barking cough. Although I am going to duck out of the time trial I was supposed to do today, I am currently still planning on doing a ~100 mile ride out to Ohio, West Virginia, and back to Pittsburgh tomorrow. I figure that even if I feel completely cruddy today, as I sit here in my office feeling like I just want to curl up on the floor, I COULD be on a bicycle feeling just as cruddy. Maybe I'll feel like hell. But, I'm pretty sure I am capable of riding for 5 or 6 hours in this condition. And, if not, I'll take a break and get back to the burgh a little bit later than expected. This holiday weekend I may also be upgrading my crankset to a Shimano Ultegra, if I can get it to work with my current setup. From what I've heard from others about this upgrade, it could add another 1-2 mph to my speed, with the same amount of effort. Get Your Guts In Gear Ride, leaving tomorrow! Tomorrow I leave for the Get Your Guts In Gear Ride for Crohns and Colitis! I'll be riding for three days, and will do my best to get some handlebar-cam footage while I'm out there. This year I'm honored to be the United Ostomy Association of America rider on the NY ride! Keep your fingers crossed for no rain! I'm just hoping the forcasters in NY are as inacurate as the ones in Pittsburgh, otherwise it's going to be a very wet ride. p.s. - Just in case you are reading this and are interested in donating to help support the UOAA in keeping up it's good work, you can! Donations of any size are very sincerely appreciated! Click on the link on the right (under "links") or go to ibdride.org --> click on "donate" ---> enter "Travis Rabbit" under the rider name and "NY-3" under the rider number. 67 miles down, two softball games to go! That's me in the garish shade of day glow yellow. I wish I got off work in time to do another long ride tomorrow! I'm going to try to keep this blog less about racing and more about just plain old bicycling with chronic medical issues and an ostomy, and all the considerations that come with that. But, since it was my first TT at the track, I am posting all the gorey details. Apparently, I am now entering the world of racing at the velodrome! The TT: It was OK. I didn't meet what I know to be a very reasonable personal goal, but I do have some ideas as to why. And, I'm totally ok with that. It means I have a lot of room to improve and can expect to be satisfied next time around. I suppose it's to be expected that it was a learning experience, being my first. Regardless of times or skill, IT WAS FUN! I enjoy working for something, and it is pretty awesome to share a track with the super fast guys on the aero bikes (fancy, real TT bikes) - their wheels make crazy noises when they zip on by! 1.) Five miles is really very short. I lost track of a lap and realized that the end was approaching when I was only 0.2 miles from the finish. Ooops. So much for pushing myself at the end! 2.) Corners. Mine are bad. I need to practice pedaling harder and leaning more through them. 3.) Probably staying out till 4am the night before is not a good idea! 4.) Must yell name louder when finishing. Those were my major items of the day. I also learned that it makes sense to actually practice the distance on the track before the race. This seems very obvious in hindsight. But, seriously, before the 10 mile TT coming up, I will be practicing. That way I will know what sort of pace to maintain at what points in the race, instead of guessing or taking other people's suggestions. This time I drastically overdid the pacing and probably could have pushed a lot harder a lot earlier on. Still waiting on my official time! I know it was somewhere in the 14's, which is not terrible but not great. And, next time I will be smarter, faster, better! I just treated myself to a bowl of vanilla bean ice cream, for the heck of it, even if my average speed was not what I was aiming for (22) this time around. I'm pretty sure I can fix this by improving my corners. Can't wait for the metric century ride in the morning! Here's hoping it stays as perfectly temperate out as it has been this week! The beauty of a clean chain! Tonight was bike maintenance and cleaning night! Gratuitous bike photos to follow! Cleaning your chain and all other moving parts is incredibly important, if you care to keep your bike in any sort of good working order. I imagine I'm preaching to the choir here. But, in case you didn't know, there are a few really easy to use chain cleaning tools on the market that will save you time and make keeping everything running in good order a lot less of a chore. I use the Finish Line chain cleaner, which I think I picked up on sale online somewhere for around $20. It has cut an hour of work and clean up time down to about 10 minutes total. A clean chain is just so satisfying! And, downright pretty. I also changed my tires because one of them was splitting. Blue! two cyclists were hit at the intersection of Allegheny River Blvd and Washington. The gold SUV turned into the first, hitting his front wheel. He suffered a fractured femur, pelvis, ribs, and other serious injuries which put him in the ICU. The other cyclist went over his handle bars and landed ten feet in front of the first, with injuries to his face and torso. The SUV never stopped. It's a sad day when an intersection becomes a place to be feared. The Ride of Silence is both a day to commemorate fallen cyclists, and also a reminder to be safe on the roads. And to remember that even if YOU are riding safely, cars may not be paying attention to your speed and distance. ... but, this week I'm going to be doing my first time trial. I've never done any sort of track racing before, but yesterday I was encouraged by a couple of people on the Pitt cycling team to try it. I know my corners are terrible and that will slow me down, but looking at the listed times for last year's five mile time trials, it doesn't seem completely unreasonable for me to give it a try. Who knows what will happen?! The worst I can do is be terribly slow, or crash... I'm sure there will be an update on this new adventure soon. In other cool news, I had almost forgotten about the June issue of The Phoenix magazine featuring an article about the Get Your Guts In Gear Ride for Crohn's and Colitis! I'm quoted! Pretty neat stuff! I just got the new issue in my mail today. Fitness and speed are all comparative. There is no single definition of fit, or fast, or having endurance. Since I've started cycling regularly again I've been riding both by myself and with local groups, more or less formally. The benefit of riding by myself is that I can set my own goals and pace, but maybe my route choices are less interesting (or maybe I chicken out of the steep side of the high point?). Riding with a group is nice for the knowledge of great routes, or the challenge of keeping pace with faster riders, or the lessons one learns simply from riding behind somebody who's been cycling for 40+ years. But, often group rides end before I feel really done. And, lately I've been looking to improve my speed. I was starting to feel really good about my abilities and speed, especially up hills, with the groups I was riding with. I've been popping off the front too easily, and having to wait at hilltops too often. And then, WHAM, it happens. My confidence bubble is burst. I ride with a much more skilled and fit cyclist. The sort with perfectly circular pedal strokes, even up hills that drag to a mere 3 miles per hour. I get flattened, reminded that although it was long and hard the route of last weekend was NOT the steep side of the slope, and then I suddenly feel like a beached whale that somehow got hoisted onto a bicycle that I hardly know how to ride. Once upon a time I was fit and knew how to ride a bicycle. What happened to those days when I didn't get winded so easily going up the steep side of the mountain? Oh, right, I got sick. Even now, I am less than two years out of the hospital, having had numerous surgeries and complications including sepsis, a DVT and a PE (big clot went to my lung, it really wasn't much fun). And, after that almost the first year was a struggle even getting back to an average (for Americans, who have admittedly pitiful standards...) level of fitness and recovering from extreme nutritional deficits (and then recovering from my recovery from nutritional deficits). When I remind myself that for being about 7 months back into truly cycling again (I'm not counting commuting as a start time), and two months of that being only on a trainer in my dining room, I think that I'm not doing so terribly after all. I'm in the frustrating position of being too slow to hang with the truly skilled and fit cyclists, yet... but, that will change. I have a goal. Distance is nice, but I will be working on my speed now as well. My resolution is to continue to push myself beyond my comfort zone to the point at which I think I'm going to fail/vomit/fall over/die (but, not really, right?) at least 3 rides a week in an effort to avoid becoming complacent and too comfortable in the same weekly ride. And hopefully I can persuade kind people to let me hang on their wheel some more while I try to keep up! Reminder of the day from a kind person who humored my struggling up a different side of Troy Hill today: Don't touch the breaks around corners on the descents! Don't even think about it! You'll get yourself killed! Yes, since realizing my mortality a couple of years ago, I've suddenly become a bit nervous when I can't see what's coming around the next corner on a descent. As a sort of trade off for not being able to keep up towards the end of today's ride, I tacked on an extra 20ish solo miles up around the north part of the city, through the zoo, back down to the university area and then across to the east end, back to Lawrenceville, then south to Oakland. On speed, and shorts with a waistband that works. It's been a good week for bicycling! Last weekend I rode Pedal Pittsburgh's 50 mile route, which was a fun tour of some of my favorite Pittsburgh hills! It was also a reminder that I need to spend more time in North Park, and a little kick in the pants to start looking more at my speed. Who did I ride with? I have NO idea. Two guys named "Tim" and something else. Maybe the first one was named Tim. I'm not sure. The people I was going to ride with bailed on me at the very last minute, and I got to the start of the ride after everyone riding the longer route (there were people on hybrids planning to do 25 and 35 mile routes left) was gone... except for two guys on the sort of bikes that make me drool, wearing sponsor kits. So, I asked if I could ride with them [till they dropped me being clearly implied]. Holy smokes. FAST! We rode a 20+ pace for the first hour and caught the rest of the riders at a midway checkpoint after blasting through the first checkpoint. It was going up the seemingly never ending winding hills on the north side of Pittsburgh at that pace that did me in. Soon after we caught the rest of the group, they dropped me. Or rather, I let them drop me in an act of self preservation and sanity before I died of spontaneous combustion. It was inevitable. I probably could have gasped my way up another hill, sounding like a broken tea kettle. But... nahhh... I wasn't prepared for that sort of ride. If I was expecting something other than a 50 mile C pace cruise I would have done a lot of things differently. But, this ride was useful. It proved that although I can't sustain that pace for long, I AM finally again able to ride that sort of pace over a difficult course for at least some time (even if I feel like I might actually die while I'm doing it. Seriously.) 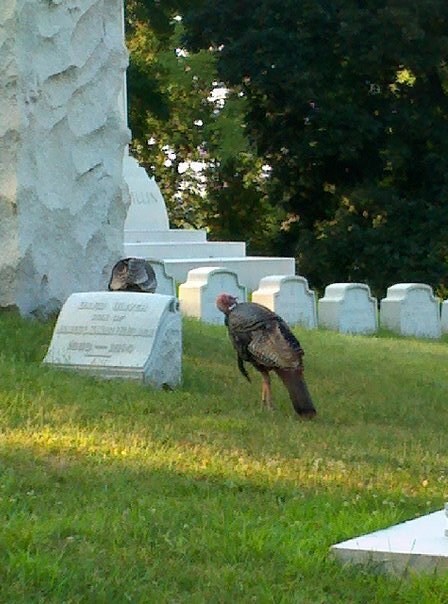 And, I can truly climb hills well enough to hang with a more serious crowd, for a little while at least. This put a bug in my head. While I had been focusing much more on endurance and distance, now I'm starting to think about speed and wanting to push myself more in that area. I also want to start riding steeper hills. Next week I'm going to be riding with a new group, at a faster pace. I'll be sure to update on how that goes! Still looking for people to ride with other days of the week, who are in the 16-19 pace range. In other major news, Yale may be in my future next year (not this year, one year from now), and they have a much friendlier cycling team than Pitt. So, my new goal will be getting back into shape and up to speed to join the Yale team when/if I get there. Recently, I've also solved one of my big problems with cycling attire. Shorts. Having an ostomy makes wearing spandex shorts interesting, and difficult. Besides basic things like needing to time eating and pay a lot more attention to what I eat pre-ride, I also need to have shorts that have a waistband and waist placement that agrees with my ostomy placement. Most cycling shorts are intentionally high to avoid lower back exposure while cycling, but high in the front is not a good thing if it means a waist band that keeps on trying to ride up and bump into the appliance. So, I've been hunting for shorts with a lower waistline that are still serious enough to have a decent chamois. I've found them! I swear Performance did not put me up to saying this. I'm actually so anti product placement that last time I posted a picture of my bloody knee I blurred out the logos! But, Performace makes the best short I've found with a lower waistband. It's the Performance brand Elite short, which I'm told is made for them by IP. Other people start biking to work too! 1. Stop at the lights. Don't rush your ride until your comfortable with your route. Rushing means careless mistakes. 2. Look up basic bicycle safety tips with as much or little detail as you need. If you are reading this, I know you have the internet.Wear visible clothing, a helmet, and get lights! 3. Baby wipes are the answer. Put extra deoderant and a big box of baby wipes in your office cabinet and clean up in the bathroom when you get to work. 4. Pack your work clothes in a bag and wear something else to bike in. You'll never make it up that sort of a climb without needing to change clothes. 5. I prefer to bike in bike shorts because I think they are comfortable. Wear whatever is comfortable for you. It doesn't have to be neon or spandex, although I do have a certain fondness for dayglow. 6. It is ok to walk the rest of the way up the hill. Nobody will fault you, and walking up that hill is good exercise too. Over the past couple of months I've also organized a couple of recreational, after-work, glacial (D) paced rides and billed them as a social event for research people from the department. After the first one, people started pulling their neglected bikes out of the garage and fixing them, or asking for advice on what kind of bike to look at if they wanted to get one. On the 26th, the next research bike ride takes place and I am glad to say that we will have four new riders with newly fixed or acquired bicycles! Wow, so, it turns out that there are FOUR gutless cyclists in this city. That's right. There are four of us, plus some other Chronies. Sounds like we've got a gutless gang forming! Now we've just got to get everyone together for a ride, and round up all of the other gutless cyclists in the area. Nice. Know any gutless cyclists? Or gutsey cyclists with Crohn's or Colitis? Put the word out. The gang is recruiting. But, seriously, I think that if I weren't gutless, cycling wouldn't mean so much to me now. It is both a reason to live and a coping mechanism, especially during really tough weeks. Whether the stress is related to health stuff, academic or work pressures, or all of the other garbage that comes with trying to exist in the modern world, cycling is an escape and a mental adjustment. The pain of hill climbing is cathartic, cresting the top of the big one might be enough of an accomplishment for the entire week, and flying down the other side is when I finally feel like I'm catching up with all of those spare minutes that escaped me throughout the week. This week has been tough. I seriously needed tonight's ride. And, while it was nice to ride with a group (~40 riders tonight) I mostly kept in line and kept quiet instead of riding side by side with anyone. Sometimes just the forward movement and feeling of freedom is more important than conversation. And, although it's not a competition, it is always gratifying to be able to drop the rest of the group on the climbs. Over and over again. Which, I was afraid that tonight I wouldn't be able to because I've been so exhausted lately (anemia again?). It was the ride I needed, although a little bit more pain and exhaustion would have been welcomed. Sometimes I am reluctant to stop riding, not because I really want the miles or the exercise, but because I want to delay returning to the real world and everything ahead of me. If I could just keep on pedaling forward, maybe the parts of reality that I don't want to face would never catch me. And that's the highs and lows in summary for today. Tonight I FINALLY got to ride with a group that meets up at a local cafe popular with the cyclists of the area. It was a great goup, a nice pleasant C ride with room for conversation between hills. I was proud of myself for being able to drop everyone on the hills, especially the longer slopes. But, sadly, I was having some drive train problems and ended up having to drop off the end of the ride towards the very last few miles. We were climbing a very steep hill when suddenly I dropped three gears and had zero pedal resistance. And, bam, down I went... off the side of the road onto some very large chunks of rock. 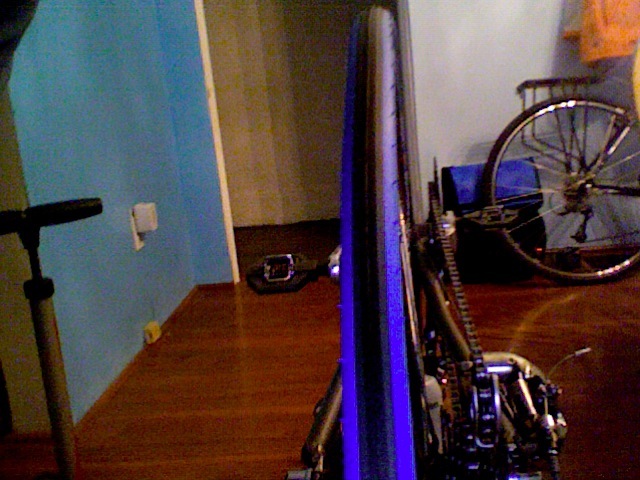 I'm fine, but sadly my bicycle has been messed up since I got hit by that car a couple of weeks back. No new damage from this fall. And, maybe it's good that I had the greater motivation to get it fixed. Sadly, all of the shops have at least a few days wait time for repairs because everyone is getting work done on their bikes since it is the beginnign of the season. I need to take it to get fixed, and soon. But, everyone has a wait of at least 3 days as of last time I checked. Rats... still, it has to happen! Other cool news: I met another cyclist with an ileostomy! How cool is that?! She is a spin instructor at Spin Shadyside, and is doing the walk for Crohn's Disease with a team. I met her totally by chance when I went into her spinning studio on a whim while I was walking around asking for donations for raffle for the local fundraising events I'm doing leading up to the GYGIG ride. I never would have guessed that I would meet another person with an ostomy in my solicitation of bussinesses for donations! And, definately not a cyclist! I'm hoping I can get her to do the 60 mile route of Pedal Pittsburgh with me on the 21st. And now I'm destined for a shower, since I'm still sitting here in my cycling shorts with my dog desperately attempting to lick all of the dried sweat off of me (ewww). I'm not sick with strep throat/eye anymore!!! Horray! Today I did an easy 20 minutes on my trainer, in the safety of my dining room. But, wow, being sick last week really took it out of me. I am still feeling tired and have a bit of a cough. It's always unnerving to be winded so quickly during a ride, of any kind! 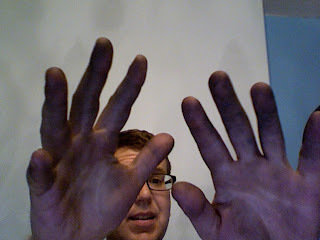 While I've been out of service for repairs, I did some bicycle repairs. 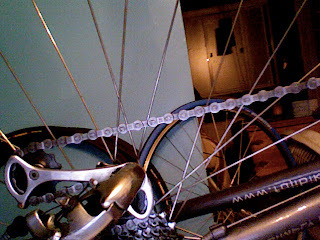 I replaced my chain, which was stretched out and starting to skip, trued a wonky couple of spots on my wheels, and cleaned and regreased everything. A clean bike is so satisfying, and I can't wait to get riding again for real. The other thing that came out of my fever last week was my new brilliant workplace fundraising idea for my Get Your Guts In Gear New York Ride. "Car commuter guilt keeping you down? Ride your bicycle to work... Vicariously! Only 1$ per day! 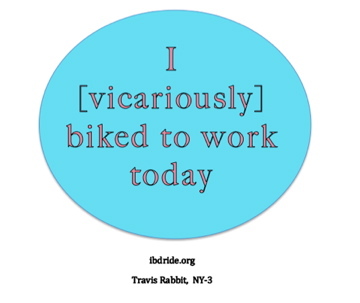 You will receive a guilt-free conscience and a stylish, 'I [vicariously] biked to work today!' sign for your door!" Is it rediculous enough to actually work??? robo-rainbow from mudlevel on Vimeo. 1. Have you ever read an article about how Crohn's is more prevalent in places with street lights? Or refridgeration? As to imply that those things are the cause of Crohn's...? Well, there may be some legitimacy to that linkage, but it is unlikely to be a causal relationship! This is where I get epidemiology geeky... stay tuned! 2. Low Dose Naltrexone. Exciting stuff in very preliminary results. I hope to do a breif literature review, and discuss what the current findings mean, in the hopes of making some sense of it all. I intend follow the further research on Naltrexone, and other clincal trials, as results are published (or maybe pre-published). 3. Nutritional deficiencies and endurance sports. The facts explained in detail, and why you should know these things if you have IBD. Oh yeah, and... I really want to make speed videos of some of my favorite routes! Sadly, I've been missing the spring weather for a few days, and have been quarantined at home with strep throat/eye. Ugggg!!! This is one of the major downsides of taking drugs like methotrexate (typically a chemotherapy drug). When I get sick, I get really sick. The quick reason why is that these drugs are cytotoxic, and make your white blood cells unable to function properly. Methotrexate is a folic acid inhibitor, which prevents cellular metabolism (mitochondia) from functioning properly. Just a short 50 mile ride... and thoughts on replacing lytes. Ok, ok... so I confess, I'm really terrible at sticking to the limits I set on myself for an easy day. I was planning on just doing 20-30 relatively flat miles today, given that yesterday I did a grueling hill hammer-fest... and got hit by cars. But... it was sunny out... and one mile led to another, and soon I was 50 something miles in and seriously bonking because I had only brought a pocket full of gummy bears and a mini banana. Baaaaddddd idea. And, really really stupid... Sometimes when it comes to biking, I can be like an addict fiending for the next mile, or like a glutenous small child binging on candy. And, both of those analogies end with somebody (me) getting hurt or sick. One thing I have learned about endurance activity while gutless, is that I have to stay ahead of dehydration, electrolyte imbalances, and hypoglycemia. And, I have to be vigilant about it. Even if I think I'm fine, I still need to drink water/electrolyte mix and eat a gummy bear every 10 minutes after the first hour to stay on track. This means that there *is* a set end time; when I run out of carbs and lytes. After that, it all goes downhill in very fast and out of control way. So far, I've been fortunate enough to have not had any real injuries from pushing too far, but I have reached the point of seizing from electrolyte derangement. Not a good time, trust me on this one! Just from having an ileostomy, a person can lose 1-2 littres of water a day! Without excercise! Now, think about how much water you need to drink to replace that PLUS what you are losing from sweat. And, add back in the electrolytes that your body doesn't absorb from all of those two litters of water that you aren't absorbing because you don't have the guts to make it happen. In addition to an extra disolvable electrolyte drink mix tablet, I also take salt and electrolyte tablets with me whenever I'm going out on a long ride, or kayaking, or hiking. That way, even if I run out of sports drink, I am able to quickly replace electrolytes even if I can only find water on my route. I have found that my mental clarity and general physical function improves dramatically after taking the salt +lytes tablet, which reaffirms that that truly was the problem. What is a salt tablet? You can get them perscribed, which is how I originally got turned onto them, or you can find similar items at sports stores (they are called things like, "endurolytes" and salt is their number one ingrediant, with potassium somewhere near second). It was actually my gastroenterologist who suggested I start using them, not a sports medicine doc. He remarked that I appeared to be in great shape and asked how the biking was going, to which I answered that I was becoming frustrated with what at that time I was describing as an intensified , accelerated sort of bonking. He gave me an Rx for something called Thermotabs, which are normally given to people with autonomic (central nervous system) dysfunction, not athletes with malabsorption issues! But, they worked! They probably even saved my life a couple of times when I was way out in the middle of nowhere; giving me just enough ability to recover to make it back to a place where I was able to more fully rehydrate and replenish glycogen stores. But, the bottom line is that I need to learn to have better self control. Even if it is sunny and the miles roll by easily, there is a time to stop. Having a medical issue is certainly not on my mind much of the time, especially when I'm riding, but there are some things that I have to take a lot more seriously than I used to. Yes, that's right! Today was a (mostly) happy day of hills! I love hills. Love love love them. Seriously. They are inspiring, I like the way they each have a personality, and I think they feel great. I love to climb. 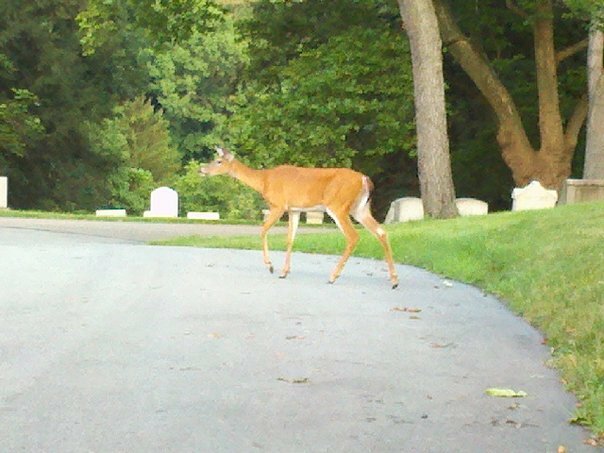 And, this is a lucky thing given that I live in Pittsburgh, the city with the steepest legal paved road in the country. But, even if I didn't love hill climbing, they still serve a purpose. Where else in an urban area can a person really go all out and peddle to their max? It's hard to find an area with enough space and no traffic lights without going outside of the city. With a reasonably light road bike, sometimes it's hard to feel like I'm peddling at all in the city. And then, a hill is a very welcome excuse to put out some effort! So, today, my ride plan was to head towards a known big hill and go up it, and then pick my route by looking for the next visible big hill and going up it, and repeat. It worked out well. I had a ~2 hour serendipedous hill-fest, with some light rain followed by a lot of sunshine, and some great sunset views from the tops of those peaks. And, then there was the getting hit by cars... luckily, both were very low speed. One was a car that realized a little two late that it was turning into me, and then basically just tapped me hard enough (while I was climbing as a low speed) to knock me over. This car was very apologetic and concerned. And, given that she did stop before really hitting me, and apologized profusely, I forgave and reassured her that I was fine - which I was. At that point, the endorphins had started kicking in and I was in that overwhelmingly giddy sunny-day cycling place that makes me unable to do much else but smile and remark on how beautiful the world is. I think maybe the big grin as I was toppling over unnerved the driver. Maybe that is why she was so concerned, thinking, "Goodness, what is wrong with that spandex-clad, strange little man who keeps on maniacly smiling at me and seems to be attached to his bicycle!?" Car number two was not so innocent or kind. In fact, he saw my flashing, reflective, bright orange blur of a person on bike and began to accelerate straight into me. I swear he even made eye contact. Luckily, I was only two feet in front of him, so he didn't have much time to accelerate. His girlfriend (who had been pointing at me) started screaming when I went partially under the front bumper. Again, no real damage done. I pulled myself up off of the ground, but didn't move from in front of the car despite the drivers trying to get me to move so he could go on with his trip. I wanted to be sure that there was no real damage to my bike before I let him drive off. I think my bike is fine, everything was moving properly when I looked it over at the scene of the incident - it seemed a little creaky riding afterwards, but that might just be because I was listening for it. What I didn't start to feel until afterwards was the point of impact; my left lower leg and ankle. I have a bit of a bruise just starting to come up, but nothing too serious. It will probably just be sore for a few days. I also sliced my knee open on the edge of their front licence plate holder on my way down. Ok, so this is a bit off topic, but I thought I'd mention that I did successfully make my way through the TSA in Pittsburgh, JFK, and Prague a couple of weeks ago when I flew to a scientific meeting. I was TERRIFIED of being hassled, or inappropriately searched, due to my ostomy or the kit (including scissors and adhesive, paste, etc) in my carry on backpack. But... they were more interested in scanning my laptop than me! This was my first major expedition since surgery, and honestly the idea of being in a foreign land with a very different food and alphabet, was a bit intimidating. (What would the plumbing be like!? What if I had an issue with my supplies?!) Over the past nearly two years, dealing with my ostomy and dietary restrictions had become effortless and mundane. But, take away a refridgerator and personal, well-stocked bathroom cabinet, and that's a different story! Or, is it? It turns out that it isn't a big deal at all. Worldwide, food is still food. Most places have yogurt, or bread, or rice, if you can't eat anything else. And, importantly, clean, running water is still clean, running water... even if the fixtures look funny to you. Now that I've done it once, I feel much more confident about my next big trip! Actually, I realized all of this and felt much more confident by my second day. An beautiful little chapel found off a trail through the park neighboring the palace. Yes, it really was this picturesque almost everywhere. I climbed a very very tall tower to get this view... if I were a monk, this tower is where I would spend my time reading. Fantastic graffiti found on a hike. this sign could mean.... anything! Another view in the other direction, with the zoom on max to try to capture the Charles bridge. A view from one of the far city limits that I hiked to after the conference. ps - I should note that I did bring a physician's note stating the medical necessity of my scissors, paste and adhesive on the plane. This is my official first post! As an introduction, I thought I'd post some profound thoughts on what it means to be an active person with a chronic illness. Or, what it means to be a guy in my late 20's with a body that is now notably different from other guys my age, since having ileostomy surgery two years ago. Or, perhaps about how I really hope that this blog provides inspiration for other people who are struggling with GI illnesses, and all of the complications that come with nutritional deficiencies, or who are trying to adjust to a life after major illness. Or, perhaps it will be a place where I can connect with other people like me? ... but, first, I'm going for a bike ride! Say goodbye to the winter trainer! Hello, Spring!